What they are: Bead sew in extensions are exactly like track and sew but instead of a braid the track is made up of a line of beads. With this method there is less pain. Hair lies flatter and the scalp can breathe more. Brushing and scratching is easier. There are no headaches and less knots. 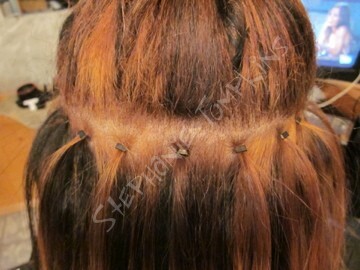 Who they are for: Bead sew in extensions are for women with average, thick, or coarse hair. They work for girls who have thin hair but if you like to be rough with your hair they will just slide off easier. They need a little more thickness to hold onto. Type of hair needed: Bead sew in is done with the same kind of hair used for track n sew. It is a long weft of hair, which is pretty much the most common hair that is sold. It is sold in one long strip, only one brand is sold in bunches. Just make sure the top is stitched across. You can get it machine weft or hand tied. Hand tied sheds less than machine weft and therefore lasts longer but of course is more pricey. Installation: Installation time takes about 1 hour to 1.5 hours. Installation includes 3 tracks which is equivalent to 1 pack of hair with every track doubled. Installation also includes a flatiron and any cutting/blending needed for a natural look. Every installation gets a take home care sheet as well if needed. Cost: $100 for installation. $20 for removal. Cost of hair varies. Hair can be picked up at Diva Hair. The cost depends on the length you want and the quality you want. Low end can be as low as $80 for 12 inches and high end can be as high as $300 for 20 inches. It is a huge range but it is your choice. There is no need to waste your money on high end hair, average $100 is still good hair unless you plan to reuse your hair. Beads are included. If you wish to purchase and bring in your own silicone lined beads you may, but this will not drop the installation price. Risks: These extensions do not damage your hair. Damage occurs from poor maintenance, styling tools, and excess pulling of the hair. Consistent scratching can create bumps/pimples and/or sores/scabs. You must brush your hair at the scalp. If matting occurs here the extensions should be replaced asap. I will not triple or quadruple tracks as the weight is too much for the beads and they slip out easier. Side Effects: Headaches are normal the first day but sleep is much more comfortable than the track n sew extensions. It is suggested you take an advil before your appointment and again before bed, but again its no where near the uncomfortable pain of track and sew extensions. Length they last: On average these extensions only last 1 month (until they grow out). Tightening cannot be done because it is sewn onto the bead. They are a more short term method, but look and feel great. How long they last also depends on how fast your hair grows and how well you take care of them. The faster your hair grows the sooner they have to be redone. Removal: Upon removal the thread is cut and the bead is reshaped and slipped off. Because of how short a time they last matting usually doesn't occur. You would have to be really not taking care of your extensions to achieve a matt. Removal is half price if a new install is done the same day. Remember that everyday we shed naturally 50-100 hairs. When you have a track the hair has no where to go it is caught in the bead. When your extensions are taken out you will lose hair. This is only your natural shed that has already fallen off. There is very little, it is completely normal. Why you should get them: Because they are painless to install. They look flat and feel very comfortable. They are undetectable if blended properly. They are easy on the pockets. They can add highlights or lowlights instantly. They add beautiful lengths and volume. They are the most temporary method of all the extensions so change is easy.